This month, our friends at Chewy.com sent us a new cat toy to try out. 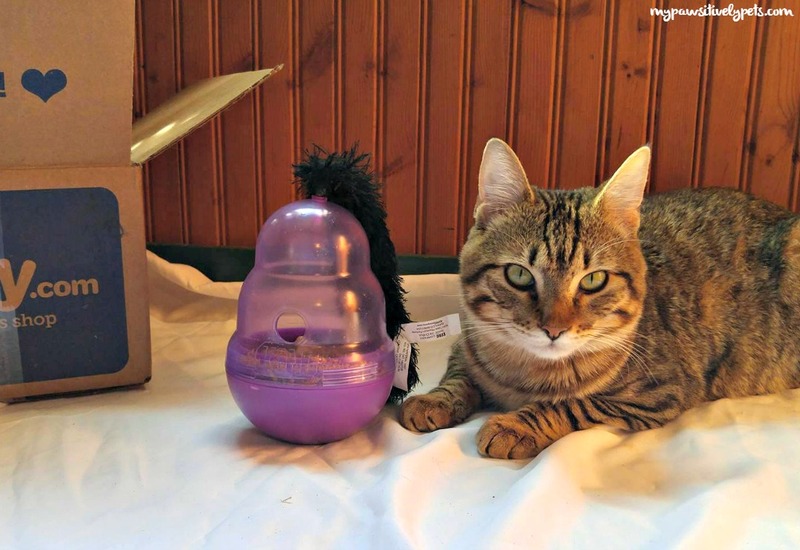 The KONG Wobbler Treat Dispenser toy for cats. I've had a few other small treat dispenser toys for cats, and mine seemed to like them so I though this one would be fun to try out as well. Roadside loves his food, so any sort of toy that involves food will probably be a hit with him. The KONG Wobbler for cats has a weighted bottom. You can unscrew the top part of it and place treats inside. There is a hole above the weighted area for the treats to fall through when the toy is tipped over. And to attract your cat even more is a black floofy, crinkly toy on top. When I first unscrewed the lid to place some treats inside, Roadside loved it. He actually picked the black floofy thing up in his mouth and carried it around the house. However, when I put the toy back together again so he could use it properly he lost interest. The instructions on the packaging state to use a highly enticing treat to tempt your cat to play with the toy. I put his favorite food inside but he never could get it out. The problem that I feel is prohibiting him from playing with it while it's weighted down is that it is just too heavy. Also, the hole that the treats are suppose to fall from is placed a bit high on the toy in my personal opinion. I do think the toy would be great for exercise, if I could get the cats to figure it out. Until then, I will let Roadside carry the black floofy part around the house since he does enjoy that. And what about Callie? Callie shows no interest in the KONG Wobbler, but I expected as much from her. I mostly picked this toy out for Roadside because he enjoys a variety of cat toys. Special thanks to Chewy.com for sending over a KONG Wobbler. 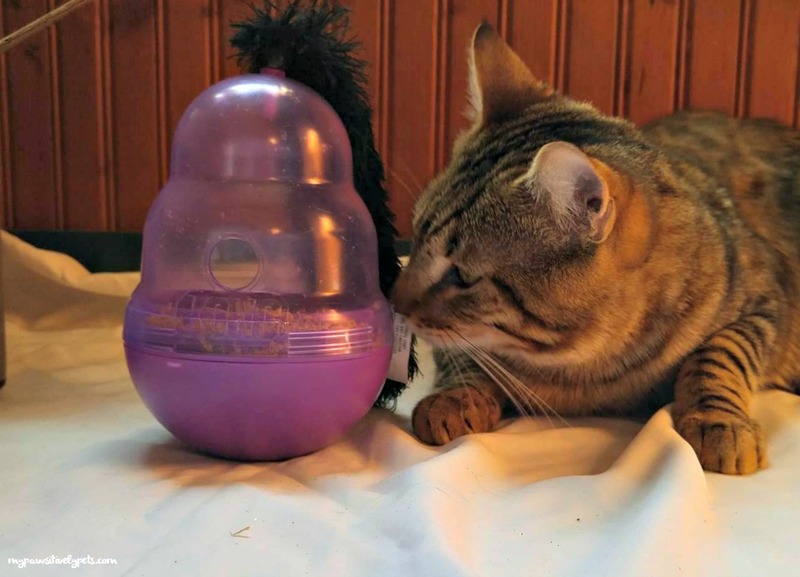 If your cat is high energy and has a big drive for food, a KONG Wobbler may be worth a try. I just wish that my own kitties were able to figure it out. Tell us what you think - would your cat play with a toy like this? 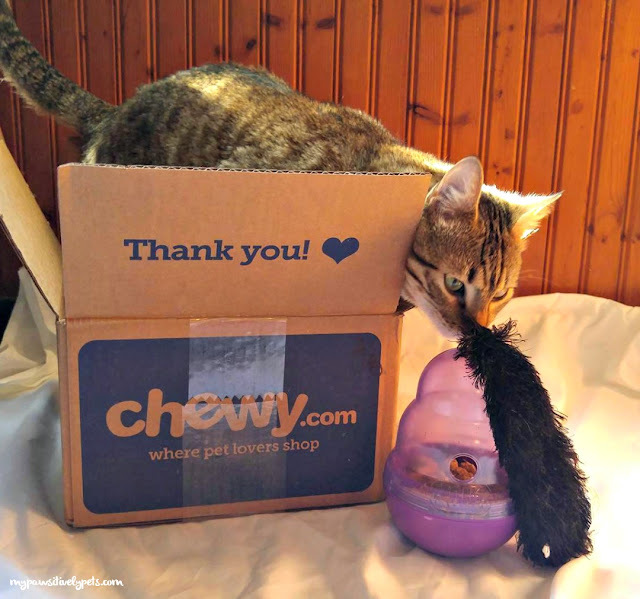 We received a KONG Wobbler for cats from Chewy.com at no charge. Pawsitively Pets only shares information we feel is relevant to our readers. This is the second time I've seen that this dispenser didn't work out for the kitty involved. Cat bro Bert would be all over that toy! This didn't go over well in our house, either. Lexy didn't like it, and I couldn't be bothered working for food. We've tried other treat dispenser thingys and really didn't like them. Too much work! But this one looks like fun. Thanks for the review. I liked the Wobbler for dogs but this is even neater! We had one of these and no one played with it, I think it is too big. We have a smaller Temptations mouse they like. I haven't read a good review of this yet. Poor Roadside. Poor Roadside! We wish yu would have been able to get those treats out of that toy! my cat usually sends food dispensing toys down the stairs to be broken open on the way and then saunters down to eat what is lef. Lol! Pretty smart. I don't think that plan would work with this one though.